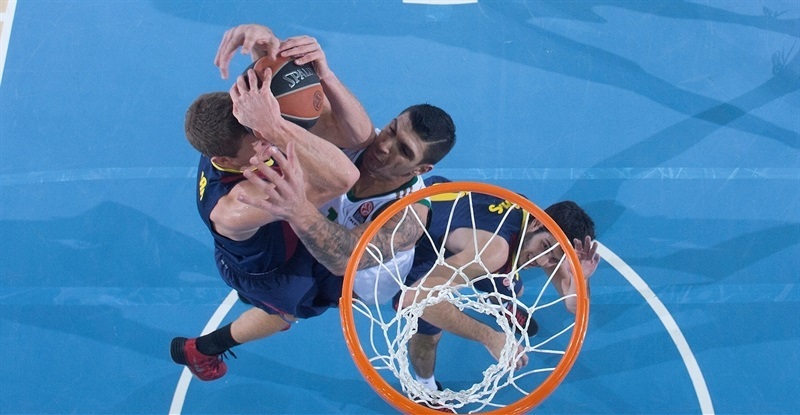 One of basketball's great rivalries lived up to its billing Friday as FC Barcelona needed a killer third quarter by Marcelinho Huertas to escape with an 80-76 home win over visiting Panathinaikos Athens. Both teams are now 1-1 in Group E of the Top 16. Huertas had a quarter he'll never forget, hitting 6 three-pointers in the 10 minutes after halftime. Five of those shots he hit consecutively in a three-minute span interrupted only by a timeout. 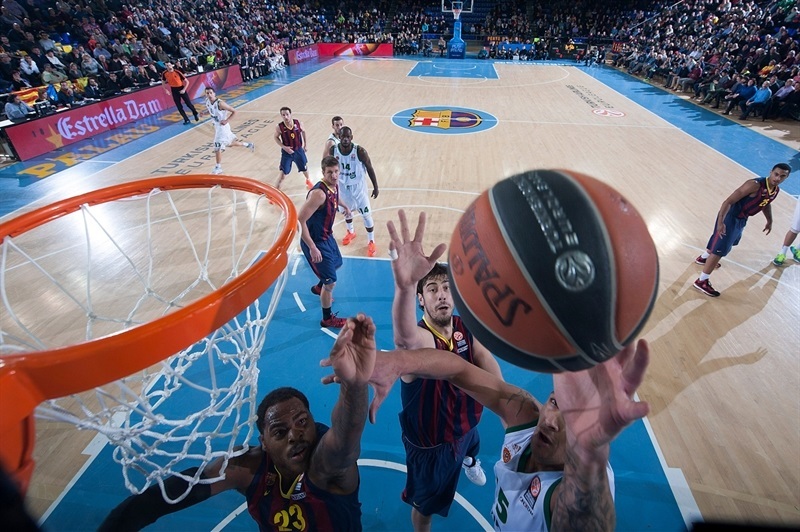 The sixth fell in fortunately on Barcelona's last shot of the quarter, giving Barcelona a double-digit lead, 63-53. 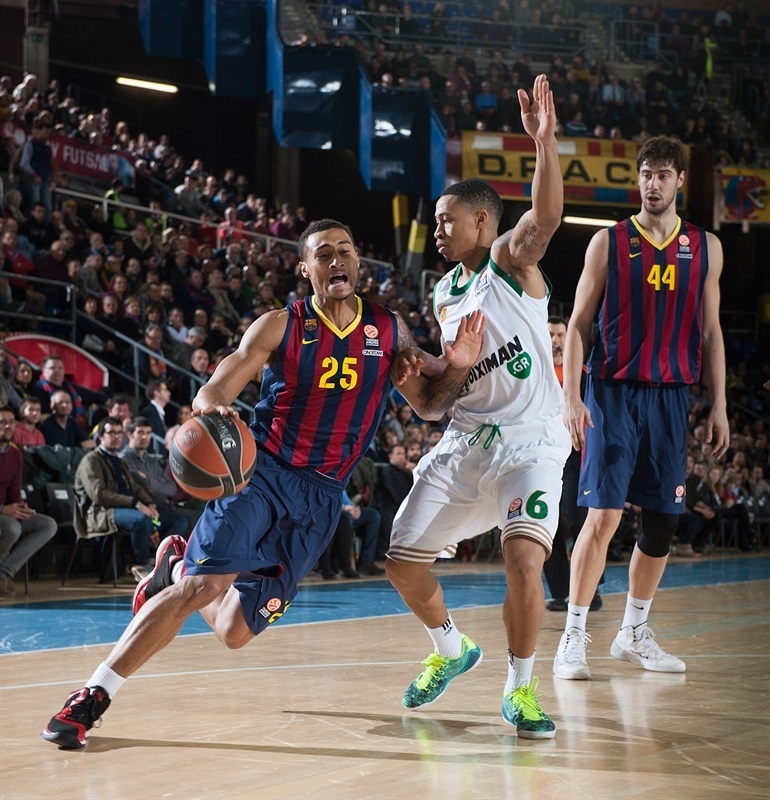 Panathinaikos, which had led by 10 in the first quarter on its own three-point barrage, came back to within a point, 77-76, on DeMarcus Nelson's fastbreak layup with 1:41 left before Justin Doellman's three-point play in the final minute finished the scoring and assured Barcelona the victory. 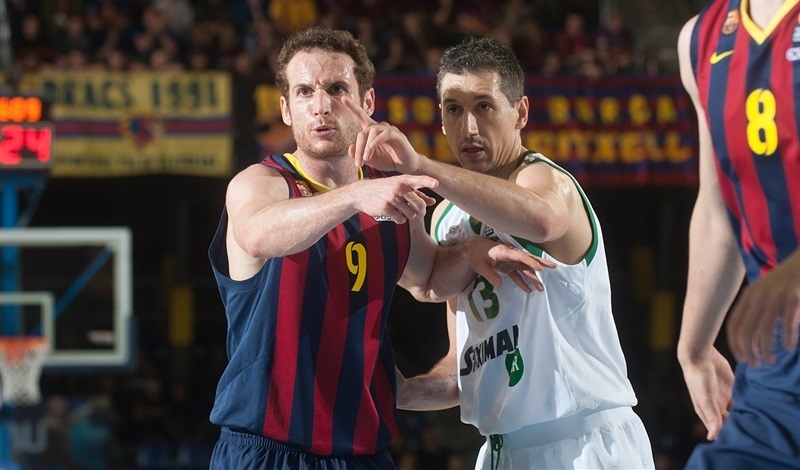 Huertas led the winners with 22 points based on his 6-for-8 shooting from the arc and dished 5 assists. Doellman added 12 points while Mario Hezonja and Alex Abrines had 11 each. Nelson scored 16 on 8-for-9 two-point shooting for Panathinaikos, while James Gist added 11 and Esteban Batista pulled 12 rebounds. 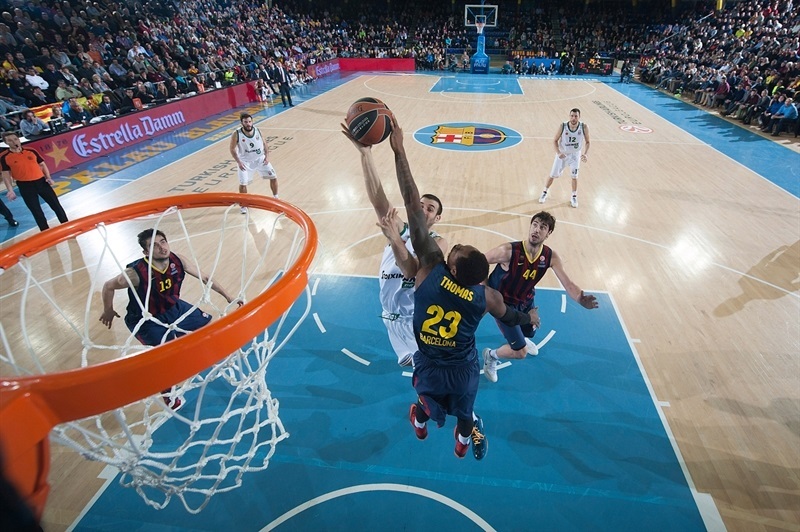 Deshaun Thomas hit a turnaround jumper for Barcelona to open the scoring. Doellman added a spinning bank shot from the post before Gist's swish put Panathinaikos on the board after 2 minutes. A steal by A.J. Slaughter then led to a fastbreak layup by Batista and a 4-4 tie. 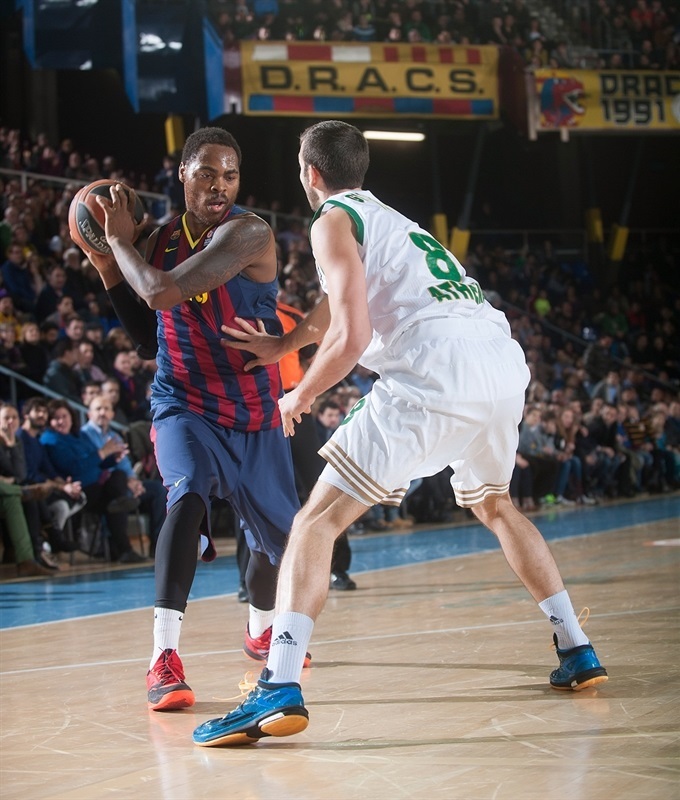 Barcelona paid for its fourth turnover in as many minutes when Slaughter drilled a triple for his team's first lead. 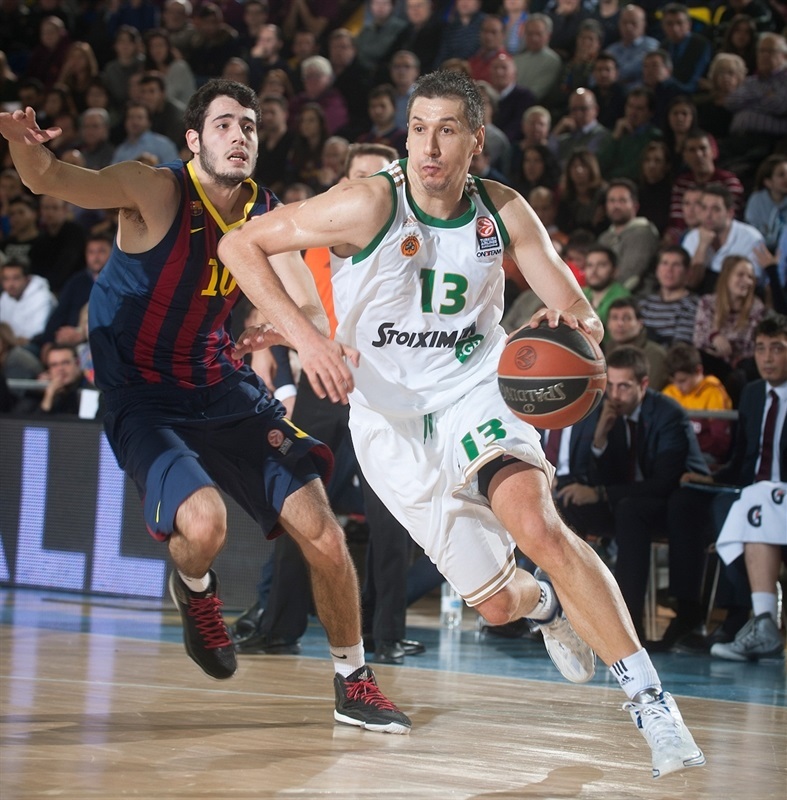 Dimitris Diamantidis and Gist soon took advantage of open three-pointers, too, as the Greens pushed ahead 6-13. Gist then measured up the fourth consecutive shot from the arc for the visitors to make it 6-16. After a timeout, Hezonja drilled Barcelona's first triple and liked it so much, he hit another, pulling the hosts within 12-18. Antonis Fotsis added free throws to the Panathinaikos lead before Abrines got 2 points the hard way, on a nifty reverse in traffic, to lock in a 14-20 score after 10 minutes. Vlantimir Giankovits put back his own miss to open the second-quarter scoring. Tomas Satoransky answered with a jumper, then Hezonja stepped up with his third triple to make it 19-22. A lull in scoring ended with Nelson burying a jumper and Huertas answering with a one-legged bank shot. 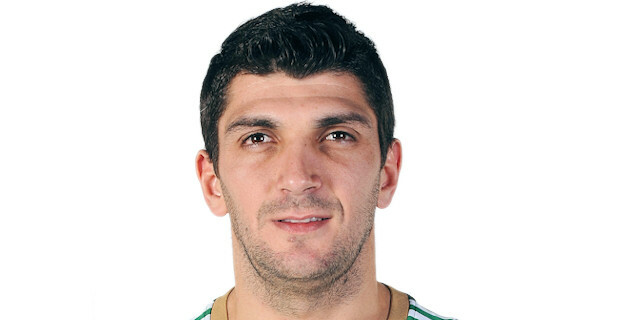 And when Loukas Mavrokefalidis hit from downtown, Panathinaikos led 21-28. Nelson and Huertas traded baskets again before Slaughter beat the entire Barcelona defense for a layup at 23-32. 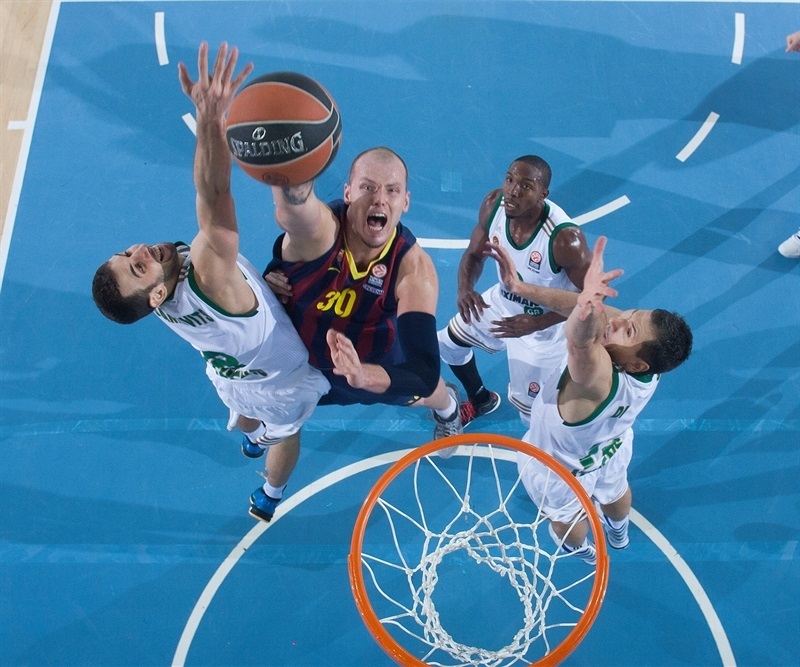 Maciej Lampe got 2 points back for Barcelona at the foul line. Out of a timeout, Janis Blums became his team's fifth three-point striker, but at the other end, Doellman matched him from deep. 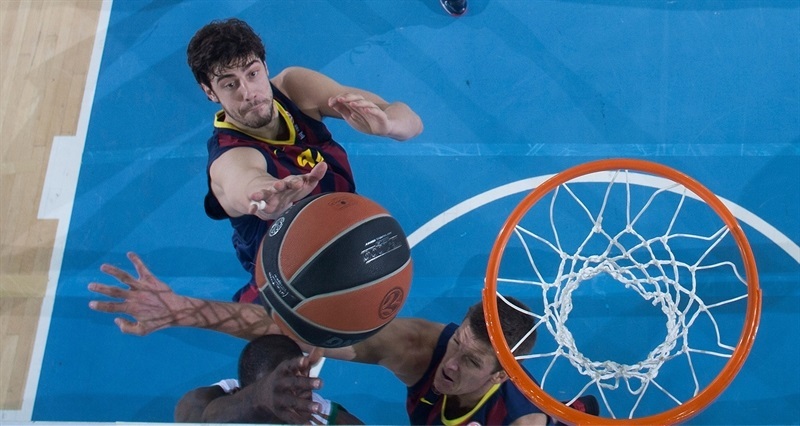 After Ante Tomic rolled to the basket for a slam, Slaughter's free throws were answered with a tip-in by Abrines. 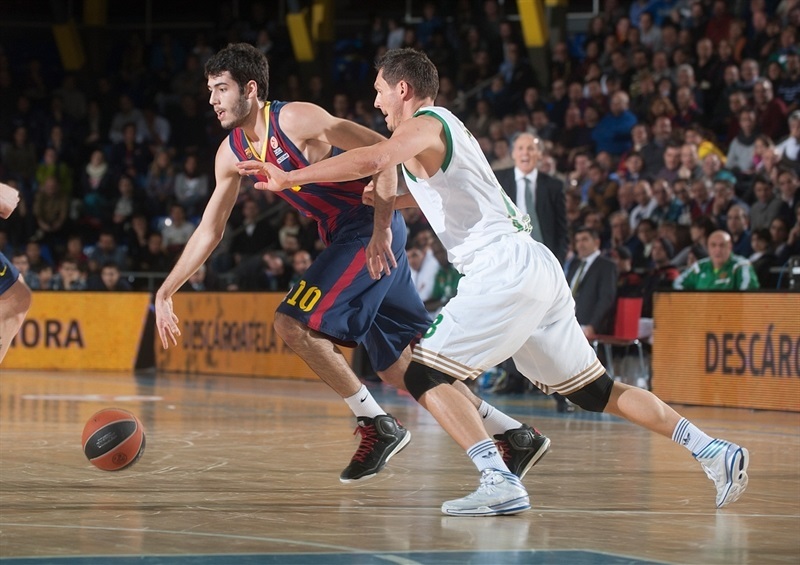 Then Huertas found Tomic on the break for a layup that put Barcelona back within a shot of the lead, 34-37. 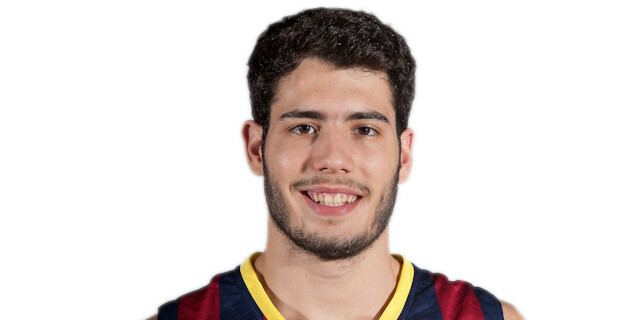 That shot came with 4 seconds left in the half off the hand of Abrines, who was left alone to splash a three-pointer that was good for a 37-37 tie at the break. A two-minute scoring lull after halftime ended with Tomic scoring in close for Barca's first lead in almost 20 minutes, but Batista doing him one better with a reverse and free throw. That's when Huertas stepped up and hit back-to-back three-pointers that had the hosts up 45-40. Nelson got a driving layup back for Panathinaikos before great ball movement found Huertas open again for his third consecutive triple. 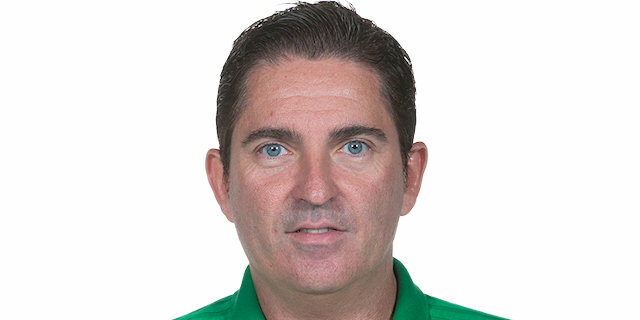 Unbelievably enough, Huertas was left alone again and did not forgive the Panathinaikos mistake. 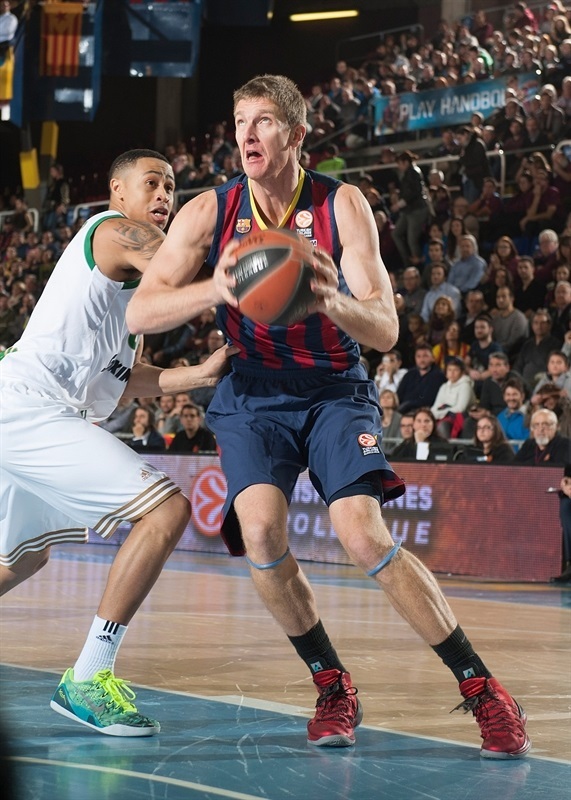 His fourth strike in a row from long-distance put Barcelona in control, 51-42. After a timeout, Giankovits hooked a shot in for the Greens, but again they let Huertas shoot from the arc and again the Barcelona guard was on the mark from downtown, giving him 5 three-pointers in under 3 minutes. Diamantidis responded from deep, Hezonja and Giankovits traded baskets, then Batista finished a break to get Panathinaikos back within 56-51. Tomic emerged from the next timeout to dribble like a guard from the arc for a reverse layup and a 58-51 advantage. Nelson responded with a step-back jumper. Thomas put back a Barcelona miss, then Huertas beat the shot clock with yet another three - this one falling in with a little luck - but Fotsis did the same on the buzzer for a 63-56 score after three quarters. Nelson, with a transition layup, and Gist, with a three-pointer, got Panathinaikos closer at 65-61 early in the fourth quarter. 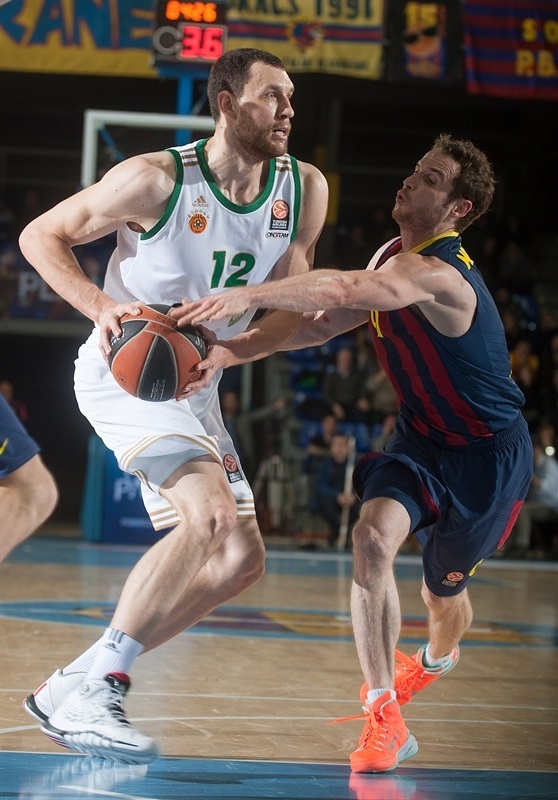 Lampe with a jumper and Brad Oleson from the arc and the free throw line pushed Barcelona further ahead, 72-65, despite baskets by Nelson and Mavrokefalidis. But when Mavrokefalidis blasted to the rim for one basket and then chased down 2 offensive rebounds that led to a triple by Fotsis, it was suddenly 72-70 with under 5 minutes left. Abrines, Tomic and Doellman then calmed the hosts by combining for 5 of 6 free throws at 77-70. Nelson responded with a reverse layup and Diamantidis got loose for another easy basket to make it 77-74 with 2 minutes left, setting up tense finish. A steal following a timeout sent Nelson ahead for a fastbreak at 77-76, but at the other end, Doellman got loose for a layup and the free throw that came with it, making it a two-possession game, 80-76, with under a minute left. That's where the score stayed after Panathinaikos committed a costly turnover, allowing Barcelona to escape with its first victory of the Top 16. "It was an important game, being our first home one in the Top 16 and also because we lost our first game. We managed to win this game with the help of our fans, even when we didn't start the game the way we wanted. We struggled in the beginning and the three-point shots by Mario Hezonja helped us, also from Alex Abrines later on. Panathinaikos is a very dangerous team when it comes to three-point shooting, but we managed to find good answers. Still, not everything was good - we allowed a lot of easy points and we have to correct that in the future. We have to play better. Stats can make some people think the wrong way: we had a +26 index rating difference but won by just 4 points. After three losses, I hope that, little by little, we will go back to our usual dynamics." 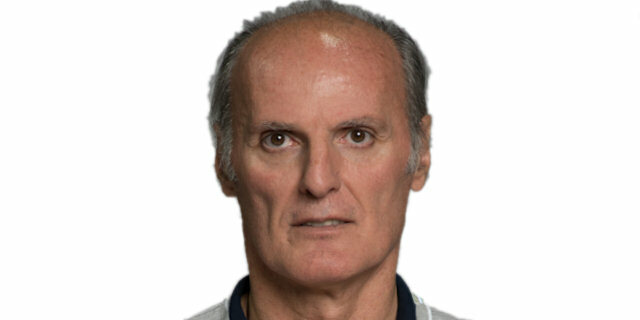 "I think we lost a great chance to beat FC Barcelona on the road. Our defense was worse in the third quarter. We didn't have a good start after the break and it is not the first time that this happens to us. Even with that, the game went down to details. It is a long way and I believe we can face anyone. We have to be ready for these kinds of games. 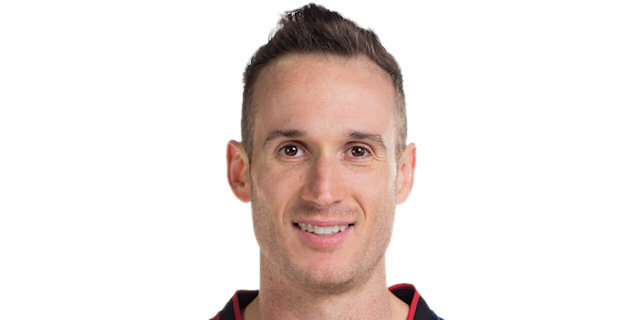 Marcelinho Huertas had a great shooting night. He is talented in a number of things, not just shooting. In the end, we lacked one good defensive stop and one fewer turnover." "Nothing is easy when you get to this part of the competition, playing only against the best teams in Europe. We know playing against a big team like Panathinaikos is never easy, not even here at home. For us, it was a good win because we came off consecutive road losses. This is good for our confidence. I think it is not the first time that I hit six three-point shots. I believe I did the same against Partizan in the past, but I don't remember scoring six consecutive ones. When shots fall in, your self-confidence rises and everything is easier. The most important thing was winning the game and we managed to do that." "I was not easy to play after coming off an injury, especially against such an uncomfortable opponent, but we were strong enough to beat them. It was very important to win after our loss last week, and we managed to do it by fighting and giving our best." "It is a shame. We lost a great chance to win. We got a 10-point lead in the second quarter but lost it too fast. We didn't play well in the third quarter but even with that, we had a chance to win the game. Nothing changes, this is just the beginning of the Top 16, we still have 12 more games to play. The most important lesson is knowing that we can challenge any opponent."